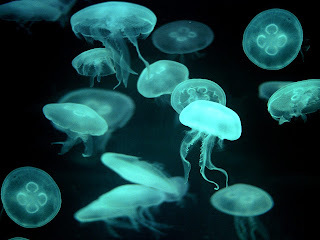 Animal Wildlife | Jellyfish | Jellyfish (also known as jellies and sea jellies) are boneless animals that float freely through the world's oceans. Although jellyfish exist in our oceans worldwide they are particularly prominent in coastal areas. Jellyfish can be found in all shapes and sizes from just a few inches in diameter to well over a metre. There are thought to be around 2,000 different species of jellyfish, the most common being the big, colourful ones found in warmer coastal areas. 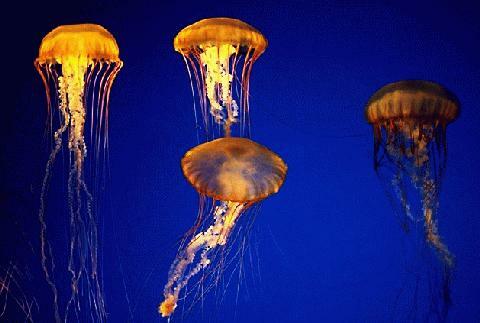 There are four different types of jellyfish that are categorised by their shape and the way in which they behave. Despite the name, jellyfish are not actually fish but are instead classed in a group of their own as they are unlike any other animal on Earth. The body of the jellyfish is made up of a non-living jellylike substance called mesoglea. This jelly is surrounded by a layer of skin that is just one cell thick. The body of the jellyfish is mainly made up of water, around 90% in fact. Jellyfish also have tentacles around their mouths that vary in length depending on the species of jellyfish. The jellyfish use their tentacles to both catch and sting their prey. The tentacles of the jellyfish are covered in a skin that contains special cells, some that sting, some that grip and some that stick. 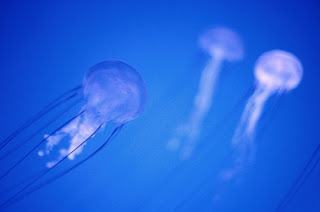 The jellyfish is able to produce these cells at an alarming rate so they are effectively disposable to the jellyfish. Some jellyfish stings contain poison which the jellyfish uses to stun and kill its prey. The box jellyfish, found in the oceans around Australia, has a sting powerful enough to be fatal to humans. The long tentacles of the jellyfish are what produces the sting. Its been tried and tested...you can touch the top of the jellyfish without being hurt! The jellyfish is a carnivorous animal and despite it's appearance, the jellyfish is a remarkably efficient predator. Jellyfish use their tentacles to stun their prey before grabbing onto it and bringing it into their mouth. 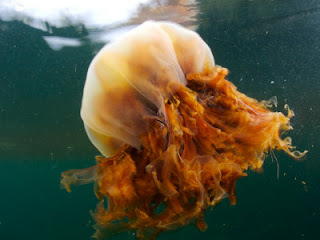 Jellyfish prey on a kinds of aquatic animals such as small fish, eggs and invertebrates along with anything else that gets stuck in their tentacles. Due to the fact that many species of jellyfish are transparent, they are often hard for predators to spot. However, jellyfish are drifters and move very slowly through the water sometimes using their tentacles to propel them along. Jellyfish are eaten by humans, sharks, squid and occasionally birds. Jellyfish release their eggs and sperm into the water which eventually meet and the egg is fertilised. The jellyfish egg quickly becomes and embryo and begins to develop in it's water world.